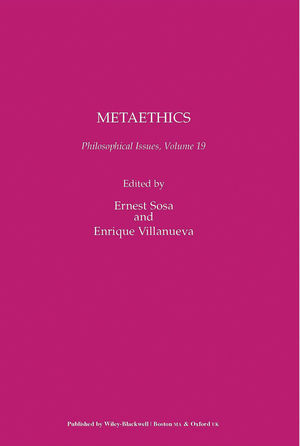 This is a collection of papers on metaethics very broadly conceived, to include, for example, moral psychology. Ernest Sosa is Board of Governors Professor of Philosophy at Rutgers, and has published extensively in epistemology, metaphysics, and other areas. Enrique Villanueva is a member of the Instituto de Investigaciones Juridicas at UNAM, and has published in the philosophy of mind. Moral Virtue and Reasons for Action (Robert Audi). Toward a Pluralist and Teleological Theory of Normativity (David Copp). Pyrrhonian Moral Skepticism and the Problem of the Criterion (Michael DePaul). Skepticism about Persons (John M. Doris). Expressivism and Contrary-Forming Negation (Terry Horgan and Mark Timmons). Values and Morals: Outline of a Skeptical Realism (Michael Huemer). The Ordinary Concept of Valuing (Joshua Knobe and Erica Preston Roedder). Real Desires and Well-Being (Joseph Mendola). Internalism for Externalists (Peter Railton). Moral Assertion for Expressivists (Mike Ridge). Relational Good and the Multiplicity Problem (Connie S. Rosati). Two Kinds of Consequentialism (Michael Smith). In Defense of Future Tuesday Indifference: Ideally Coherent Eccentrics and the Contingency of What Matters (Sharon Street). The Practical Role Essential to Value Judgments (Sigr ´Un Svavarsd´ Ottir). Intrinsic Values and Reasons for Action (Ralph Wedgwood). Emotion and the Cognition of Reasons in Moral Motivation (David B. Wong). Variations in Ethical Intuitions (Jennifer L. Zamzow and Shaun Nichols). Broome and the Intuition of Neutrality (Wlodek Rabinowicz). Reply to Rabinowicz (John Broome).